Ashley’s Restaurant is near the hospital where my husband spent some of his last days. When the kids came to see their dad they ate at Ashley’s; the waitress told them ghosts had roamed inside for years. The place has been there since 1933 with different owners and names, but it’s been Ashley’s since 1985. It’s a Tudor-style building with stained-glass windows and antique pictures. It has cozy booths, with bars and dining on both floors, it also has an outside deck and bar. The body of a nineteen-year-old girl was found nearby at the Indian River in 1934. Ethel Allen had been savagely murdered; her body mutilated and burned. It was identified by a tattoo on her thigh, a rose surrounded by a noose. No one has ever been arrested. The restaurant was Jack’s Tavern back then and Ethel was a regular; it was the last place she was seen. Weird things began to happen after her murder. A woman would be in the bathroom and see high-heeled, high-buttoned shoes from the ‘20s in the next booth. When she looked no one was there. People would see a girl in the mirror wearing clothes from the ‘20s, and a faucet would go on by itself. People hear weird sounds at Ashley’s, and there’s a stairway where they feel a push yet they’re alone. Waitresses and bartenders swear that plates and glasses break without being touched. A reporter from Florida Today named Billie Cox came to check it out in 1982. After a couple of months, there were whispers on his tape recorder, and a “loud, angry buzz” on the stairway where diners feel a shove or a push. When Billie interviewed Rockledge police officers he heard that burglar alarms go off without any force, lights go on and off with no one there; they had a call once that a woman had screamed at Ashley’s – in the middle of the night. “Everybody knows this place is haunted,” Billie reported. 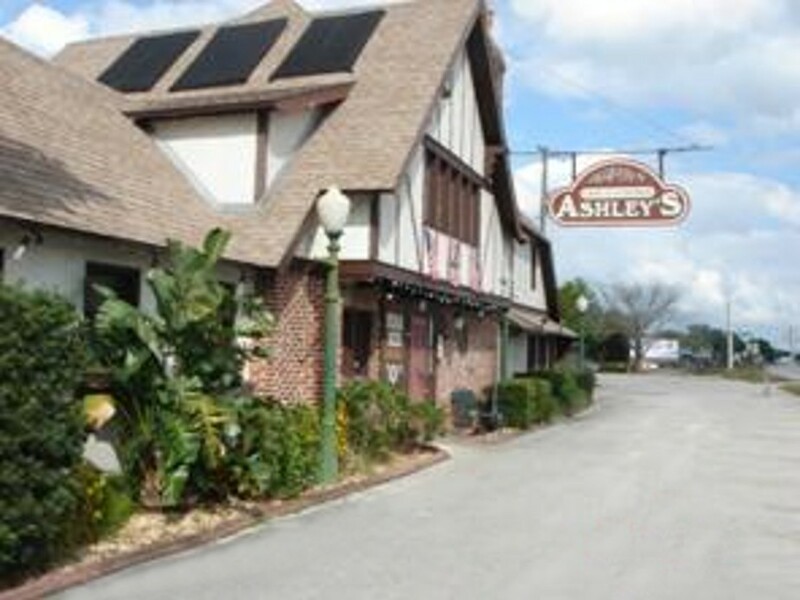 Writers, reporters and ghost hunters, lots of people, have investigated Ashley’s. Everyone believes what they want. Some think the ghost is an accident victim from the highway or train tracks out back, others think it is an old man who did odd jobs and lived upstairs. One thing is for sure, everyone believes something weird happens there. Carlson, Charlie. Ashley’s Shadow: 1. New Smyrna Beach, FL: Luthers, 2005. Jenkins, Greg. Florida’s Ghostly Legends and Haunted Folklore: South and central Florida. 1. Sarasota, Fl: Pineapple Press, 2005. Moore, Joyce. Haunt Hunter’s Guide to Florida. 3. Sarasota, Fl: Pineapple Press, Inc., 1998. Myers, Arthur. The Ghostly Register: 1. Chicago, Il: Contemporary Books, Inc, 1986. My kids were fascinated. Son David is a true skeptic, yet when the waitress took them upstairs he felt something. Tammy took a picture of something they saw and e-mailed it to me; I have tried everything and can’t get it open. Hmm, I never have a problem. A lot of people have investigated Ashley’s, but Jean Stevens is the one who caught my attention. She’s a psychic who had been to Ashley’s many times when she had a vision of a man who was dragged down the stairs by police officers. This part captured my heart. A six-year-old girl, same age as my granddaughter, was hit by a car outside Ashley’s on US1. She died on the road and her spirit wandered into the restaurant. Maybe she was drawn by the spirits inside. Once Jean went into a trance at Ashley’s and told what happened to Ethel Allen: “I saw the murder take place very clearly,” she vowed. “I saw the death take place in an area that is a storage room now. I saw a man chase a woman down the stairs, she was bleeding. He had a knife. Jean must be tormented because she knows the murderer, yet can’t say who. The man is dead, but the family still lives here. This entry was posted in Supernatural and tagged Ashley, Chicago, crime, Florida, murder. Bookmark the permalink.